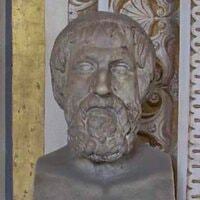 Greek mathematics was the first attempt to use deductive reasoning to devise theories linking numbers together. First developed by Thales, who built upon the empirical approach of the Egyptians and Babylonians, Greek mathematics was built upon the idea of deducing laws governing mathematics and geometry from axioms that were proved to be true. The Greeks believed, because the universe was perfect, that all of the laws governing creation could be found from these first principles. The first of the long tradition of Greek mathematicians was Thales of Miletus, and he started off the whole process of moving mathematics away from observation and measurement. 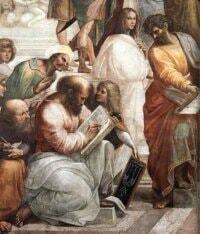 He established schools to teach others everything he knew, and the great Pythagoras was amongst his pupils. The sum of the internal angles of a triangle equals two right angles (180o). The sum of the external angles of a triangle equals four right angles (360o). The sum of the interior angles of any polygon equals 2n-4 right angles, where n is the number of sides. The sum of the exterior angles of a polygon equals four right angles, however many sides. The three polygons, the triangle, hexagon, and square completely fill the space around a point on a plane - six triangles, four squares and three hexagons. While we attribute these discoveries to Pythagoras, he ran a very secretive brotherhood that shut itself off from society, and it is difficult to establish who made these discoveries, as most of them seemed to be a communal effort. Thus, we should speak of the Pythagoreans rather than Pythagoras. 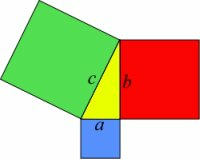 These proofs have been questioned by later mathematicians, and the way that the Pythagoreans established them is disputed, mathematically at least. The other work of the Pythagoreans involved seeking out interesting patterns behind numbers and finding sets. They believed that all of nature is built upon integers, and did not consider fractions to be numbers, only convenient ratios. This belief also shaped their philosophy and the philosophy of later Greeks, that numbers ruled the universe and would allow philosophers to deduce the nature of creation. The Pythagoreans believed that the number ten was the perfect number, and this belief shaped many of their philosophical theories. Pythagoras and his students also discovered irrational numbers, as they found that the square root of two could not be expressed as an integer or a fraction, although it is unclear as to what they did with those numbers. The other lasting contribution of Pythagoras was in music theory and harmony, when he noticed that the strings of instruments were harmonious when the lengths were whole numbers, such as 2:1 or 4:3. He also applied this to other types of instrument, and this certainly reinforced his idea that the universe was governed by harmonious laws. Pythagoras developed trigonometry and left us with understanding of shapes, angles, triangles, polygons and proportion. Alongside Thales, Euclid, and Archimedes, he developed mathematics as we know it and gave later mathematicians a solid base upon which to build. "Thales and the Deductive M ..."